I decided to shoot a video for you, and I only sped it up a little bit…I did chop out some repeat chunks that weren’t needed, so you won’t be here all weekend with me. But the video also takes a little look at the hexchart and how I picked some colors for this piece. Note that in today’s bundle, you’ll get FOUR stamps – the starfish facing two ways, the crab, and this compiled image that I’m coloring for you! Just a little bonus since I’m feeling so overwhelmed with gratitude for you guys and your support of the HexChart! The photos of orange-colored items was quite the challenge…the video shows a little more accurate color since my photos of the crab and starfish digital stamp just kept getting electric. Wahhhh! I hope you might take a stab at coloring these summertime images…if you do, tag me on Instagram so I can see what you did, okeydokey? To purchase the bundle, click on the image below! You can find all the EduDigis in THIS section of the store. Need a digi stamp tutorial? Click HERE! Don’t forget the special mission requested in the video…I can’t wait to see if it gets noticed! I’m off to another Toastmasters Contest today…I’m in the evaluations competition. I’m not nearly as good as the others at this level, so I’m not expecting to come back with an amazing report, but I’m pretty excited to just get to participate! Don’t forget the Ellen Hutson Spring Release and the HexChart giveaways! I’ve included the Tonic Trimmer everyone’s been asking me about….since I forgot to link it up last week. Whoops! Affiliate links are used, at no extra cost to you as you purchase. Read more here. Live Blue Crabs are, well blue, and green and brown… On the east coast of MD, VA and here in Florida. And They are yummy…. Yes I actually do know that….but I needed a cool image to color in orange 😉 🙂 🙂 I grew up in MD so I knew about them! Hi there Ms Sandy I so love love your work. Im new to card making and with copic markers. A few day ago just bought my 2 first sets skin tone and perfect primaries. Then I found a video of your new hex chart and want to buy one but I don’t have a computer or a printer. And im willing to pay extra for it if you are willing to print it out for me. Thanks.. Once again love your work. 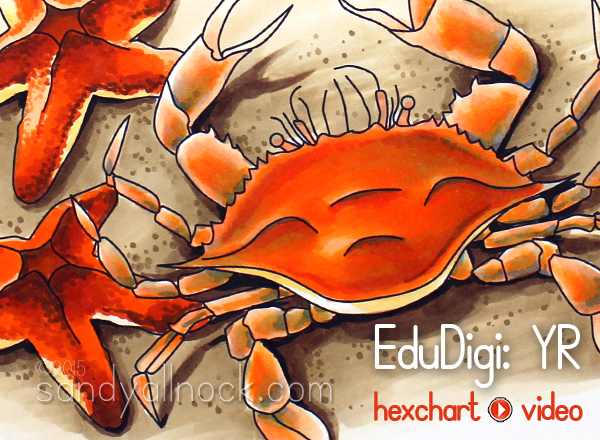 It would be wonderful if you did a video for each EduDigi. This one was very helpful. Good luck at the Toastmasters Contest! If you do your best and you learn something in the process, that will be enough! Concerning your special mission: Done and done! I couldn’t get the hex chart in, though. I’ll send it to you, if you want to see. Looks like my side of the country (Pittsburgh, PA) is going to have lovely weather. I’m going to be coloring in my studio with all the windows open! Sandy, I’m so behind on all my blog-reading and YouTube channel viewing, so this is my first encounter with your Edu-Digis. I love it! I’m so impressed with all you’ve got going on these days. Coming back to purchase the Hex Chart on Monday or Tuesday, and I’m definitely looking forward to digging into these Edu-Digis, too. Love the crab! Do shadows come to you as automatically as they seem in your videos! That is so impressive to me. Thanks for all you do! I think this was my favorite of the edu-digis to watch. Thanks so much for all you put into this series, and for ALL that you do. Wow, you really went the extra mile on this one and cannot thank you enough. 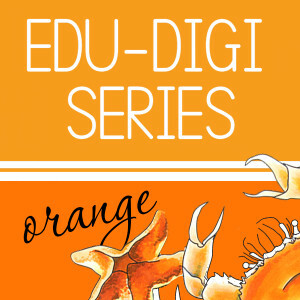 The red and oranges are hard colors to work with and this video along with the edudigi will be a fabulous assist. Many, many thanks for all your help. Watched the video also on the hex chart yesterday and that was an eye opener. Had no idea some colors are so close to others as you and others on the hop referred to in their videos. Keep up the great work. You are such a true artist with a generous pure heart! The Edu-series are truly amazing! Thanks for all you do (and the Hex Chart!)! Thanks Sandy. It was great to have the video with the advanced techniques called out. I’m not sure I would have picked up on how to do those if they had just been incorporated in to the printed instructions. I learn something new each time I view one of your videos. You’re a great instructor and your upbeat attitude always brightens my day! Hi Sandy. First, this coloring is amazing. I purchased all of the. EDUDIGIs yesterday (except this one) and I looked at them and honestly I probably won’t do anything with them. I thought, man I wish she did a video. Then, like you read my mind, today you had this fabulous video. I know they are a lot of work. But I propose you create 2 videos for each EDUDIGI. One for Copic, one for watercoloring. Sell them for $5 for both or each. Whatever you think is fair based on your time and demand. I will probably get and color the starfish because of the video. I want to see your crazy advanced techniques and awesome shading. Even if you just do one set per month. How about an EDUDIGI community (Please not facebook). Each month a different color group or subject. You can include whatever mediums you want. Its like an ongoing class and you charge a set amount per month to belong. And if people want acess to a previous months content they pay an extra amount. That way you would make money from current and past months. Anyway, can you tell I’m a big fan. 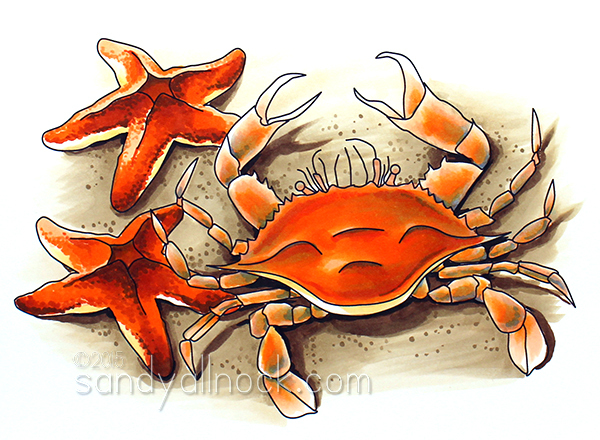 One last thing, I bet this crab and starfish are beautiful watercolored too. Thank you for all your wonderful videos. I’ll probably eventually do videos for them all over time – it’ll be a great way to let people know they’re there. But they can’t be watercolored since you’d have to print on wc paper – and I can’t figure out how to do that on my printer. Paper’s too thick, and ink would bleed anyhow. I may do one or another by transferring it a different way, but for most people it’s got to be Copic so they can just print it. Sandy, the starfish and crab are precious! Your creative thought and hard work are so inspiring. Thank you! Can’t wait to have time to play with both? Thanks for the peek at an Edu-Digi – I haven’t partaken yet, as I took the OCC on Copics last fall and am still getting my Copic “feet” under me! But this looks like so much more information – I’ll have to join the fun pretty soon… Meanwhile, the Hex Chart is providing all kinds of fun entertainment and edification – woot-woot! Love the oranges, which was always one of my main wardrobe colors – at least until I turned all gray and silver! Now, for some reason I want purples… go fig! Thanks again, Sandy – for ALL you do!